Can I Wear a Hat After Having a Hair Transplant? The Follicular Unit Extraction, or FUE, method of hair transplantation is the one we routinely use here at the DK Hair Klinik in Antalya. It involves taking individual healthy hair follicles from the back of the scalp, and transplanting them individually back into the scalp at the front and on the top, depending on your pattern and degree of hair loss. It’s considered the superior form of hair surgery over the older strip, or Follicular Unit Transfer (FUT) method. It causes less scarring and the recovery time is quicker. However, due to the nature of the procedure, some scabbing and bleeding is inevitable in the first few days and weeks. If you’re thinking about having a hair transplant, then you may be thinking about wanting to cover up the tell-tale signs of surgery with a hat. Here in Turkey, we’re blessed with hot and sunny weather most of the time. After a hair transplant, your scalp is going to feel a little tender and sore for a few days. This is nothing that normal pain relief medication can’t help, but you don’t want to be making matters worse by exposing your scalp to the searing heat of the sun. Similarly so if you don’t live here in Turkey and when you return home, the weather is hot. Plus, the very last thing you need after a hair transplant is a sunburnt scalp. Ouch! Your scalp may also be numb for a few days following surgery, meaning that you may not immediately feel if your scalp is burning. If in doubt, stay out of the sun and if you do have to go outside, make sure you wear a hat. If you’ve been losing your hair for a while, you may be familiar with how painful scalp sunburn can be (let alone after hair transplant surgery) and you may already be used to covering up with a hat. Generally getting your scalp wet from the rain or a being a bit wind blown isn’t going to harm you like sunburn will. But after a hair transplant procedure, you need to be extra careful with your scalp. Anything like rain or wind can irritate a sensitive, post-op scalp and is best avoided. Harsh rain and wind can also disrupt the delicate hair follicles and cause them to shift or even fall out of their new position. It takes around seven to ten days for the new grafts to become settled in their new area of scalp so its best if you do go out in harsh weather to wear a hat. For the same reasons, it’s best to avoid your scalp being in contact with any of the every day dirt, dust and pollution that’s present in the air. It’s crucial that you listen to the advice your surgeon has given you to care for your scalp after your hair transplant procedure. This includes the advice on washing your hair. If your scalp gets dirty in the first days and weeks, it can be a while before you can wash your hair, so it’s best to keep the whole area as clean as possible. A hat will help protect your scalp from dirt and grime. Also, dirt and dust can cause an infection in both the donor area at the back of the head, or the recipient area at the front. Even though the holes created from harvesting and implanting hair follicles are tiny, in the early days following surgery, they’re still open wounds. They vulnerable to infection and although rare, it’s still a possibility if you don’t keep the area clean. An infection in the recipient area can result in an uneven new hairline. 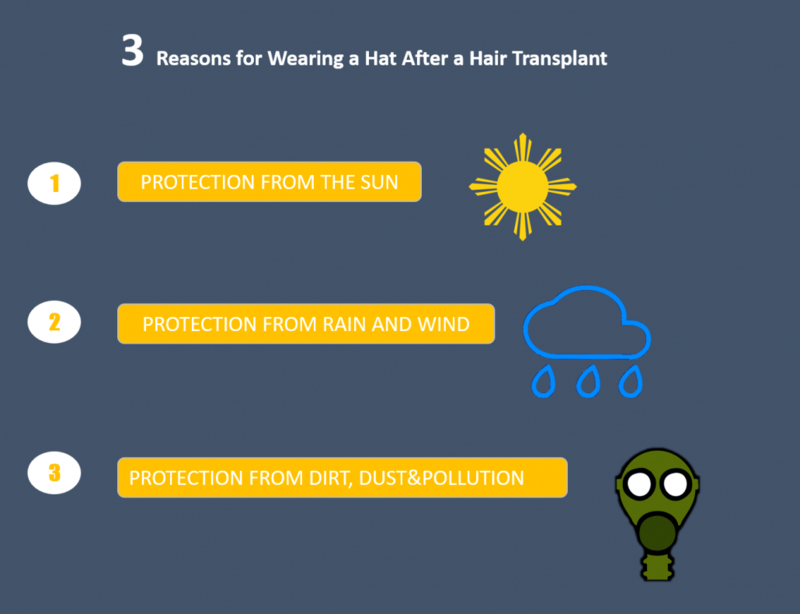 Our surgeons recommend that you wear a hat each time you go outdoors after hair transplant surgery, if the weather is bad, for the reasons mentioned above. They don’t recommend that you wear a hat indoors and if the weather isn’t too hot, wet, windy or dusty, then it is fine to go without a hat. 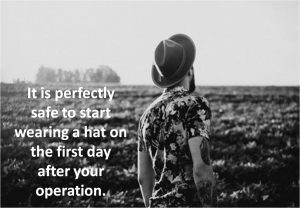 It is perfectly safe to start wearing a hat on the first day after your operation. Firstly, make sure you don’t try to put a hat on that is too tightly fitted. It should be a very loose fitting hat. If you’re unsure, bring your hat to your consultation or surgical appointment and your surgeon can advise you. Place your hat onto your head gently using both hands. Don’t rush it, taking your time will ensure you don’t accidentally knock any areas that you shouldn’t be. Make sure that the hat doesn’t have a tight headband that will rub onto your newly transplanted hair. When it comes to taking it off, again use both hands and do it slowly and gently in an upwards motion. Don’t be tempted to quickly pull it off with one hand or at an angle. To avoid an infection or the treated area of your scalp becoming dirty, make sure you keep your hat clean. Wash it regularly and don’t use the same hat again if it has blood or any other fluids on it. It can be a good idea to have more than one hat of the same loose fitting type to hand so that you always have a clean one ready. Again, if you are in any doubt, it always pays to talk to your surgeon or someone from their office. 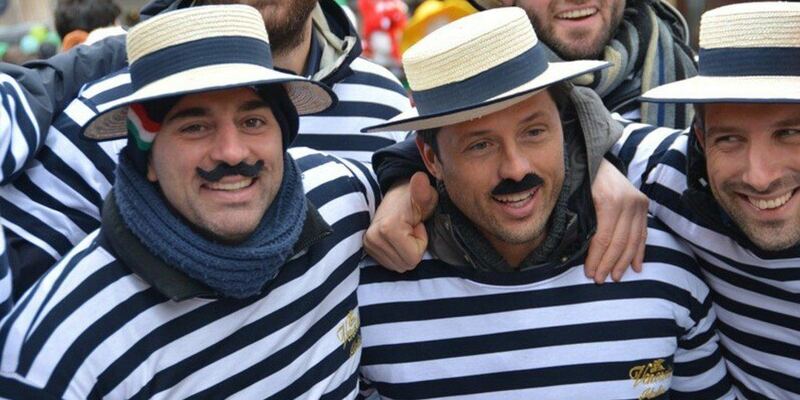 How Long to Wear a Hat After Hair Transplantation Surgery? The physical signs of hair restoration surgery can often last longer than the post-op pain and discomfort. You may feel absolutely fine, but your scalp will still be healing for a number of weeks, so it’s advisable to continue to wear a hat to protect it from dirt and bad weather until your surgeon gives you the go ahead to stop wearing it. This will then leave you to get on with enjoying your amazing new hair growth when those exciting scalp tingles start, indicating that your newly transferred follicles are kicking into life in their new home! Contact us today, or fill in our free online consultation form to see how we can change your hairline forever. « Do Hair Transplants Work on a Receding Hairline?